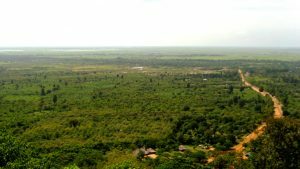 Phnom Han Chey has official name Chey Kiri Mountain located at the East of Kampong Cham province, at the northern part of Mekong River. This resort located at Han Chey village, Han Chey commune, Kampong Siem District in the distance of 18 kilometres by water and 20 kilometres by land. The mountain can be climbed up by 295 beautiful stair steps, and has pagoda and the temple of Kuk made of ancient solid bricks each has seven-square meter size. In addition, there is another temple having square shape made of sandstone located at the North of pagoda; at the valley of the mountain, there is another temple called Pra Sat Neang Khmao made of stones each has seven-square metre size. The mountain of Han Chey has beautiful scenary and also has many visitors; the international visitors who go there as group by boat. Recently, there are many tourist sites which have been found in the province Kampong Cham; but not yet operated for tourists to visit. Along the Mekong River, there are a beautiful bank and island of Pen, which have been needed by the provincial visitors ho visit there during the Khmer New Year festival. 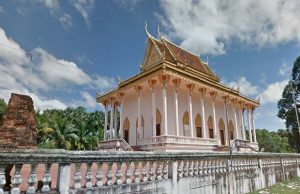 Phnom Han Chey lies 20kms north of Kompong Cham city, on the banks of the Mekong River and boasts an interesting collection of ancient prasats and modern-day pagoda buildings. On my recent visit the whole area was heaving with people celebrating the P'chum Ben festival, having travelled from far and wide to join in the ceremonies. My presence was warmly welcomed as the only barang in their midst. 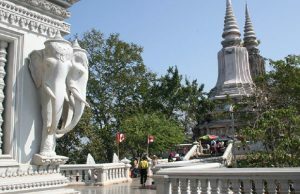 The site is also known as Chey Kiri mountain and for the energetic there's a 295 step climb to the top, or for the older visitors like me, there's a couple of drivable roads to the top. 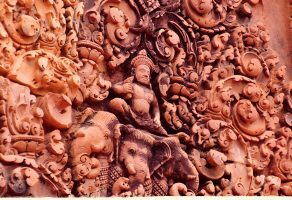 Next to the main vihara at the pagoda of Wat Han Chey, sat on the summit of the mountain and surrounded by gorgeous views of the Mekong, is an unusual square sandstone cella with a series of well-defined carvings. Above the only door to the cella is a narrow lintel which shows two images of the reclining Vishnu, though surprisingly there's no Ananta, the snake on which Vishnu usually lies. the two images are arranged as decorative elements along with three medallions on what is believed to be a pre-Angkorean structure, most likely from the 7th century. At the foot of the cella are miniature stylized representations of a larger temple, almost in the style of the 'flying palaces' of Sambor Prei Kuk, where a similar cella resides. Other imaginary animals appear in a decorative frieze around the base too. A larger stupa-styled concrete pinnacle has been added to the top of the cella. Altogether an unusual and interesting 'find' at Wat Han Chey. There are other historical elements to Han Chey, as there are more modern and garish monuments.